Rachel has an excellent site for her hair dresser’s shop, it is just off the Old Moshi Road, a main road into Usa River. The salon is just opposite a little outdoor café and it is a busy place. The windows and door are open and the room is full of light. Rachel is happy in her work and always has a smile for her customers. She has a well-equipped salon which she has decorated with lots of pictures of hair designs and has plenty (rather too many really!) of seating for customers and their friends. There is a relaxed atmosphere for her customers to sit and wait for their turn, or just to sit and chat as we did. When we arrived Rachel was out as she was escorting one of her elderly client’s home but she returned as quickly as she could when she heard we had arrived. In the meantime her assistant, Paulo – a very tall Masai – was busy plaiting wool extensions into a girl’s hair. He has been working at the job of plaiting for some time and is very quick at his work. Rachel rushed back to her next client, an older woman who wanted a simple French plait style and was holding a bag full of hair extensions to thicken out the plaits. Rachel worked quickly and the hair do was completed in less than 15 mins for 1,000/-. These two plaits will last 1 week and then the client will be back for another hair do. Rachel charges by the length of time she spends on each hair do and the girl having her extensions braided will pay 15,000/- (£5). A full ‘dawa’ and wash treatment will cost up to 10,000/- but there will be a maximum of 10 clients per day for this kind of work. Despite her optimistic smile, life has not been easy for Rachel. Some years ago she began looking after her sister who was sick with HIV, and when she died Rachel took in her sister’s children as they had no one else to care for them. Her elderly parents also need care and her husband is unable to contribute to the household earnings as he is alcohol dependent. They were living in rented accommodation and Rachel was finding it very difficult to provide for her 4 children and her sister’s children. She got to know James Ruby, the Community Coordinator at Usa River and he suggested she seek Mondo’s help for financial assistance. She was given a grant in January of 250,000/- which she put towards renting a salon and buying stock. She is fortunate to have her 2 older daughters to help her at home and in the salon. 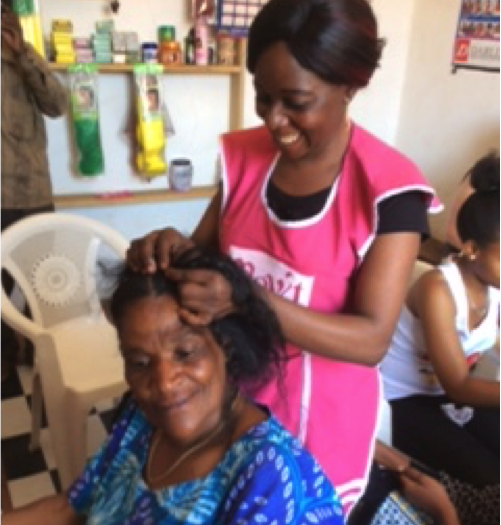 Jacqueline, the oldest 24 years, now has her own little business buying and selling which brings in some money, Janet, 20, helps Rachel in the salon, shampooing hair and keeping the customers happy. Her two other daughters are in school. Money needs to be available to pay school fees, provide food and medical bills when necessary. Rachel starts work at 7am and works on until 9pm or 10pm as long as there are customers. Rachel’s business is successful and she has now requested a low interest loan from Mondo to continue to expand. With this she will restock her salon with the lotion for hair straightening, hair conditioners, hair extensions, she hopes to buy a new drier and a generator to run her appliances when the local supply fails. If you would like to help support more women like Rachel, we are currently raising funds for our next round of grants and loans. To help us achieve our target you can donate here.